Steroids can be detected, but a little surgery to enhance sports capability apparently is OK. I just can’t wait for the reality show version of this – follow the teams’ heroic surgeons as they slice, dice and mix for your viewing pleasure…. This entry was posted in Nerdy ruminations on February 25, 2005 by Espen. Anyone who has been the recipient of a “cease and desist” letter should take a look at the Chilling Effects Clearinghouse website before responding. This is an excellent source and a great example of how universities and research organizations directly benefit society. This entry was posted in Digital reflections on February 22, 2005 by Espen. 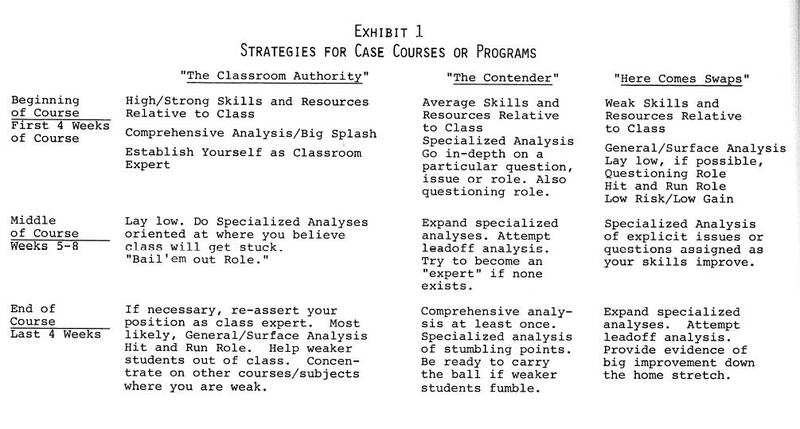 My colleague and fellow case teaching enthusiast Mark Kriger dug into his files a few days ago and showed me Robert Ronstadt’s The Art of Case Analysis, a self-published how-to for prospective students in a case teaching environment. 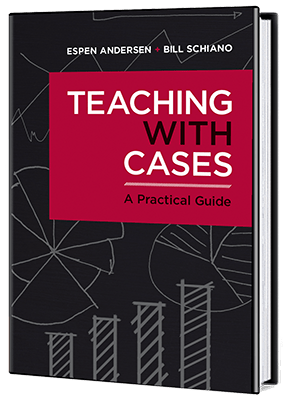 This thing is fantastic – it has strategies for how to look smart in front of the teacher (see exhibit), where to sit in the classroom, and roles to play in the classroom. Also has pointers to preparation and case ethics, as well as some basic analysis. My, what a cheat sheet for students….. This entry was posted in Teaching on February 21, 2005 by Espen. Anyone who enjoyed Douglas Adams‘ The Meaning of Liff will enjoy Fouroboros’ executive lexicon. This entry was posted in Humor on February 20, 2005 by Espen. JohnJim McGee (with whom I briefly overlapped at Harvard) has written an excellent essay on architecture of buildings and systems based on Stewart Brand’s book How Buildings Learn. 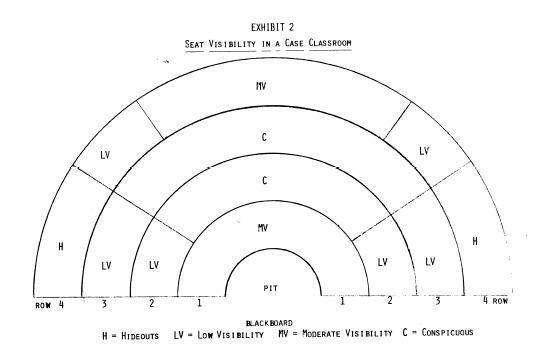 I first encountered this perspective back in the mid-90s, when I worked at CSC and Richard Pawson pursued the same ideas, thinking about how systems architecture could learn from the adaptive architecture ideas of Brand and Christopher Alexander (who wrote A Pattern Language, a collection of architectural “ideas that work”, much read in the circles that practice extreme programming). I have recommended Stewart Brand’s book for years (and have given away at least 3 copies so far, the last time when we were designing the new building for the Norwegian School of Management). It really is an amazing book and an enjoyable read whether you are an architect, a systems engineer, or just someone who happens to take an interest in your surroundings. Highly recommended (both the essay and the book). This entry was posted in Digital reflections on February 20, 2005 by Espen. This blog seems to be degenerating into the usual “this vs. that” technology, so here goes: I recently went from Mozilla 1.7.1 to Firefox/Thunderbird (Mozilla’s new browser/email client). Verdict so far: Mixed. I have gained a better email interface (faster and less errors, and the great ability to save searches as folder). Firefox is also a marginally better browser than Mozilla 1.7.1, with better bookmark handling, RSS inclusion (though I use Bloglines, so it shouldn’t matter much – or perhaps that was Thunderbird?) and more robustness. However, I have lost the easy integration between email client and browswer, and the (admittedly not wonderful) HTML editor is gone. I cannot click on a link in an email and choose “open in new tab” or even “open it new window” – instead, it will open in the top window of Firefox, pushing aside whatever I had there. I can do ctrl-m to compose a new email message when in Firefox. A good thing with F/T is that if one app crashes (and face it, it happens), then I don’t have to shut down the whole suite. But the integration I am referring to should be easy to accomplish. And how do I easily link in an editor under Firefox – I would very much like to be able to hit ctrl-e and go right ahead editing. As it is looking now, I will probably keep Thunderbird but go back to Mozilla 1.7.1 for browsing and editing. This entry was posted in Nerdy ruminations on February 17, 2005 by Espen. Via Gizmodo comes this mocked up Mac Mini back-pack docking station. Let me be the first to point out that this looks uncanningly like one of the weirdest computer products ever to see the light of day: The MacCharlie, a wrap-around PC-compatible computer that turned a Macintosh into an IBM clone back in 1985. This entry was posted in Digital reflections on February 16, 2005 by Espen.